Roof equipment Make sure they’re OK with the equipment you’ll be putting on the roof and the location. Let them know that you’ll seal the roof where you install the mount. Wireless Access Point Location Help the customer find the best place in their home for their wireless router. If they are switching to your service from another provider ask them if there are places in the house where the wireless signal isn’t great and see if you can help them find a better location. Note that you will need to get a cable from the roof outside the house to the router - balance the customer’s needs against your tools and ability to run the cable. Cable Entry Point After you’ve decided where to place the customer’s wireless access point determine where to bring the cable in the house. You may need to drill a hole through a wall to bring the cable in (in a similar way to satellite TV or cable TV installations.) Let the customer know what you’ll be doing and respond to any of their concerns. Cable Run Show them where you’re going to run the cable from the roof to the entry point. Try to hide the cable as much as possible using rain gutters or other features of the house. Put the base of your ladder on a flat, dry surface. Make sure the top of your ladder extends at least 3’ above the roof line. Make sure the top of your ladder is against a flat, even surface. Read more on Roof and Ladder Safety. Plug in an extension cord somewhere on the ground or in your vehicle. Some types of radios (like Ubiquiti and Mimosa) broadcast a wireless network specifically for configuration that will allow you to connect directly with your phone and check radio stats. In this case you won’t a device with an Ethernet adapter. Otherwise you’ll need to connect your laptop or other device using Ethernet directly to the PoE adapter to log in to the radio. If the speeds are acceptable according to the customer’s expectations and the speed plan you’re selling then go ahead with the install! J-Arm Mount - Simple, low profile. Tripod - Can hold masts up to 10’ tall for better line of sight. Pitch roof mount - Taller than J-Arm, can be mounted on pitch for better aesthetics. Be extra careful when walking on tile roofs - the tiles can break very easily. Avoid walking on the roof if possible. VM 2000 / VM 3000 - Mount a J-Arm to a tile roof without drilling or removing tiles. VM 3000 has extra arms for more stability. 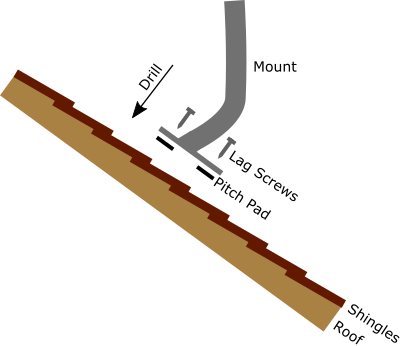 Gable Mount - Mounts at the edge of a sloped roof. Never drill in to a flat roof! Drilling in a flat roof will almost certainly cause leaks in the long term even if you seal the holes. This is especially important if it’s a membrane sealed roof as drilling will void the warranty on the membrane. Light duty flat roof mount - Can hold masts up to 10’. Weighted down by cinder blocks. Not as heavy duty (or nearly as expensive!) as the flat roof mount in the infrastructure section. Wall mount - Mounts flush to vertical wall. Pole-to-pole mount - Mount to an existing pole or other structure. Chimney Mount - Attach to a chimney without drilling. Use lag screws and a pitch pad to fix the mount to the roof. You can get a kit that includes both or they can be purchased separately. Remove the paper from the pitch pad and lay it on the bottom of the mount, then drill the lag screws through the pitch pad directly in to the roof. Never drill in to a flat roof! Drilling in to a flat roof will almost certainly cause leaks in the long term even if you seal the holes. This is especially important if it’s a sealed membrane roof as drilling will void the warranty on the membrane. Use one of the other mounting options instead. Position yourself behind your antenna and aim the antenna as well as possible toward your tower. At this point the radio is not powered on so you won’t be able to aim using actual numbers yet. Tighten the antenna down when you’re done and get ready to run the cable. Alternately: Find a way to power up the device while on the roof so you can aim it completely at this point in the install. You can bring up an extension cord or use a battery pack to power the radio. When the radio has power follow the steps in the Aim Antenna by the Numbers section below. Aiming the antenna completely at this point in the install might save a trip to the roof later on but also means carrying more equipment to the roof. Place your box of shielded CAT5e cable on the ground near the base of your ladder. I prefer Shireen brand. Cut a few inches back on the loose end and then make an end on the cable. Pull the cable up to your mount and plug the cable in to the radio. Use zip ties to secure the cable to the mount down to the roof line. Don’t pull the zip ties so tight that they deform the outer shield of the cable and make sure to leave some slack at the very end so the end in the radio is not pulled tight. Make sure to use UV rated zip ties - they come in different lengths but the black ones last the longest. Lay the cable along the roof securing with zip ties to any existing pipes extruding from the roof. You can also use cable clips to secure the cable to the roof but this means putting more holes in the roof that will need to be sealed so I avoid it if possible. At the edge of the roof bring the cable around the eave or the rain gutter and secure with zip ties or cable clips. Run the cable down the wall behind a rain gutter if possible and to the area where you’ll be entering the home. Go inside the home and use a stud finder to identify the best place to drill. WARNING! Use a stud finder that has live AC wire detection to make sure you don’t drill through a live AC power line. Drill at least 3 inches away from a stud. For aesthetics, drill at the same height in the wall as other AC adapters and data jacks. Drill through the wall using an 18” long 3/8” drill bit. Make sure to use the right bit - if the wall is wood and siding you can use a wood bit, if it’s cement or brick use a masonry bit. Push the cable through from the outside. Make sure to cut the cable long enough to give yourself 2-3’ of slack on the inside. Loop the cable in to a drip loop on the outside of the wall to make sure water doesn’t run down the cable in to the house. Use sealant around the cable on the outside of the wall. Install a cut-in-ring in the drywall around the area where the cable comes in. This video and this video explain a few different methods of doing that. Terminate the cable in to a shielded RJ-45 jack, preferably a tool-less jack or a coupler so you don’t need to use a punch-down tool. Note: It’s important that this jack is shielded so that it can properly ground the shielding on the CAT5e cable. Put the jack in to a faceplate and attach the faceplate to the cut-in-ring. Connect a shielded patch cable from the RJ45 jack in the wall to the powered port of the PoE injector (usually labelled ‘POE’). Connect the other port on the POE adapter to a laptop. Plug the PoE adapter in to an AC wall outlet. Make sure that it is a grounded 3 prong outlet. If you have followed the above steps regarding shielded cables and components the chassis of the radio on the roof will now be grounded through the third prong in the AC outlet. Within a few seconds the radio will power on and you should have an Ethernet link light on your laptop. You can now log in to the radio and check the wireless stats. If you used the router configuration from the Fiber Location Installation section then you can use any unused IP address from 10.0.0.2 through 10.0.0.255 as a management IP address for the radio. Keep a record of the IP address that you use so that you don’t use it again on another device and so you can get to the device later to manage the configuration. Most of the software platforms listed on this site will keep track of IP addresses for you so you don’t have to do it manually. If you aimed well enough visually and you have DHCP configured properly you will now be online. Congratulations! Even if you’re online continue to the next step to make sure you’ve aimed the antenna as well as possible - a poorly aimed antenna will cause problems down the road. Log in to the radio from the ground and check the RSL (Receive Signal Level). The Receive Signal Level is measured in dBm and will be a negative number - typically between -45 and -85. Closer to 0 is better and every 3 dBm improvement represents double the signal level, so it’s worth it to spend a few minutes to get a few points closer to 0. If you’re using Ubiquiti or Mimosa CPE Radios then you can aim the antenna easily from the roof. Take a phone or tablet to the roof and connect to the configuration WiFi network that is broadcast by the device. Log in and you will see an interface with a live update of the RSL. Move the antenna slowly to the left and right and then up and down and lock it down when you find the spot with the best RSL. If the radios you’re using do not broadcast a WiFi configuration network then you will have to find a way to read the signal while on the roof. If you have a partner helping with the install you can have them read the number off to you from inside the house. 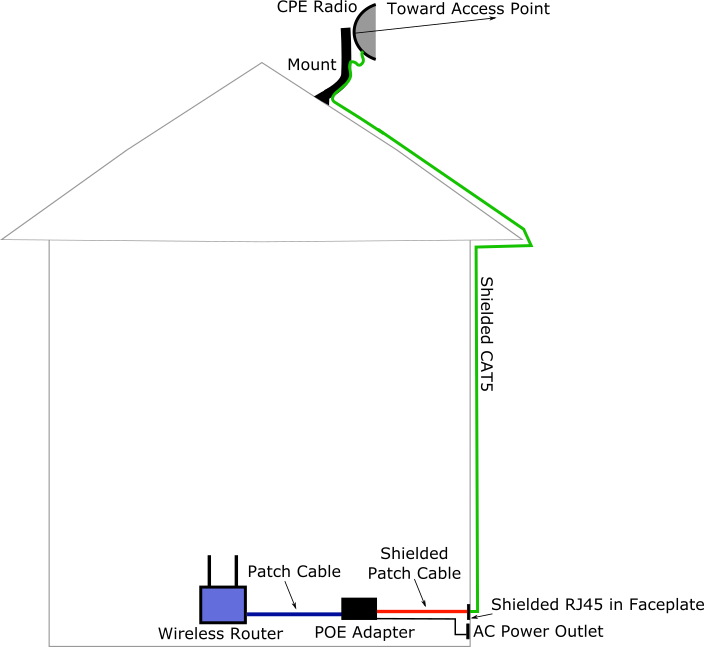 You can also pull an extension cord and a PoE up to the roof to power the radio and connect to it directly with a laptop on the roof. If everything has gone right at the point you’ll have a stable connection to the Internet. Run a speedtest on your device. Then connect the WAN port on the customer’s wireless router to the LAN port on the PoE device. (It might not be labelled LAN - just make sure it’s not the port with PoE power coming out of it). If it’s a wireless router they had been using with a previous provider then it should just work - all of their devices will connect right back up. If not then you may need to factory reset the router and help the customer re-configure it. If you are providing the wireless router for the customer you can help them configure it and make sure their devices connect to it. Make sure the cable is terminated properly and that there are Ethernet link lights on both ends. You can use a cheap cable tester to check that the pins are crimped in the right order and there are no shorts in the cable or an expensive cable tester to fully verify the cable. Make sure you get a DHCP address when you plug in a laptop to the LAN side of the POE port. If you don’t and everything else looks right you may have a problem at or upstream from the Access Point. See if you can ping the gateway address. If not you may have a problem at or upstream from the Access Point.